There is a shot near the beginning of the film when Unicron is approaching Lithone where the rings of Unicron appear in front of a Lithonian building which SHOULD be in the foreground. In the real world, Daniel would have been blown out of the escaping shuttle from the airflow while Arcee was being pulled in by Springer. During the battle at Autobot City, an Autobot's legs move past in the foreground as we see Perceptor (and Grapple) firing in the background. The legs appear to be those of Swoop's, although Swoop has yet to arrive on Earth at this point. When the fallen Decepticons are thrown out of Astrotrain, we see Thundercracker (the blue jet) and Skywarp (the black jet) get thrown out with Megatron and the Insecticons. We see them get turned into Cyclonus and the Sweeps. 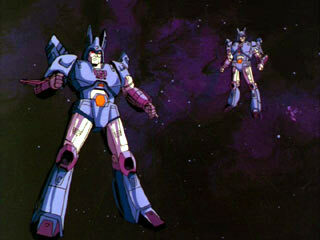 But later, we see both of those warriors on Cybertron during Starscream's coronation. 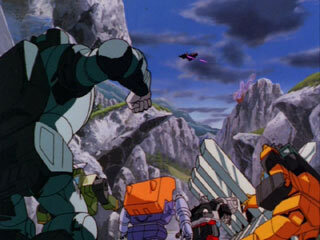 We also see the Insecticons later, but fans just say the ones thrown out of Astrotrain were just their "clones." 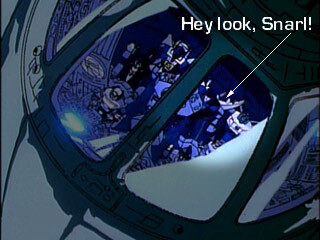 The appearance of Snarl within the movie may be an animation error. There are five Dinobots total, but the movie only really features four of them, leaving poor Snarl (the stegosaurus) behind. However, when the Decepticons return to Autobot City, Ultra Magnus says, "to the shuttles," and we see an overhead shot of four Dinobots, EXCLUDING Swoop and INCLUDING Snarl. We also see his dino-head a couple of shots earlier as the camera pans to the right during the "This new menace is more dangerous than all the Decepticons together" speech. So when did Snarl arrive on Earth, and where was Swoop in this scene? Even stranger -- we also see Snarl in robot mode for a couple of frames as the Quintesson ship flies by the planet of Junk, inside the cockpit along with Hot Rod and Kup. So how did he end up on this ship, and where did he go afterwards? Hot Rod's transformation scheme changes, depending upon the animator who drew him. In one scene, his upper torso rotates 180 degrees, but in another it just flips up. 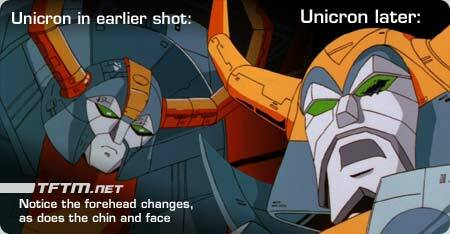 Unicron's head (specifically his forehead region) is drawn a bit differently during the 'transformation sequence' than elsewhere in the movie. This is likely due to the fact that this sequence was animated much earlier than the rest of the film, and changes were made to the character designs at this point. (See Trivia section, about the pre-release promotional reel.) This might also explain the shift from Autobot City's colors from all white (original version) to all orange (shots animated later). When Unicron attacks Cybertron, the Decepticons fight back, and we see a jet that looks exactly like Starscream fly past us for a few frames. But Starscream is already burnt toast at this point. One of his clones?? When Daniel arrives at the digestion pool inside of Unicron (where his father is about to be dropped from a conveyor belt), he appears at the base of the pool before he even walks up to it. When Soundwave ejects his tapes to stop Blaster from sending a signal to Prime, Rumble (or is it Frenzy?) is colored purple, and in the next shot he is blue. When Blaster ejects Rewind and Eject, they both alternate between blue and gray colors. Devastator's chestplate changes color from one shot to the next. When he first forms together, it is lime green, like the rest of his body. In the very next shot, it is suddenly purple, as it is supposed to be. At the beginning of the movie, Optimus asks Jazz for a 'security status' over a comm link, indicating that they are far apart - but only a couple of shots later, they are standing right next to each other. Perhaps more time elapsed between these scenes? Maybe Optimus didn't feel like walking into the next room? How could the Autobots in the shuttlecraft (Prowl, of all guys) not detect the Decepticons until they were breaking through the hull? What, no radar? In the comic adaptation, (as well as the early draft of the script), the Decepticons attack while the Autobot shuttle is passing through a dense asteroid field, rendering their radar useless. It is often pointed out that Astrotrain's request to "jettison some weight" was a scientific error on the part of the writer. Since there is no gravity, and therefore no weight in space, why would he need to lose some? There are several explainations, however. Steve Stonebraker, in the TF FAQ file, points out that while there is no weight in space, there still is MASS. It could have been possible that Astrotrain needed less mass to decelerate before approaching Cybertron. Devastator forming INSIDE of Astrotrain??? Astrotrain IS supposed to have a lot of cargo space in shuttle mode, but does he really have that much? After Moon Base 2 (with Bumblebee and Spike) is eaten by Unicron, and Galvatron gets mad that Cybertron's moons belong to him, you can see yet another moon still orbiting Cybertron. While it is not explicitly stated exactly how many moons of Cybertron there were in total, it is implied that there were only two. This error was probably due to the fact that the scene where Unicron eats Moon Base 2 was supposed to come much later in the movie, as it does in the original script and the comic adaptation. Thus the moon visible in that shot was supposed to be Moon Base 2, but due to the change in editing of the film, this does not make sense. I list this error in the "possibly not an error" section because it could just be a third Cybertronian moon. How did Hot Rod and Kup know that Magnus and the other Autobots had crashed on Junkion? The comic adaptation says that they traced the path of the debris. Optimus takes a couple of shots to his ribcage, and dies. Ultra Magnus is blown to bits (he is actually drawn and quartered by laser beams in the original script), and he is repaired in little amount of time by the Junkions. Huh? My explanation is that maybe Optimus's main energy core or some other vital organ, er, component, was right there in his ribcage. Notice Megatron cut him wide open there first, then he shot him in the same spot a few times. If this was in fact Prime's weakest point, then Megatron did a good job of killing him. Perhaps Ultra Magnus was not hurt in any vital areas. If he was "drawn and quartered" then only his limbs were removed, and since he is a robot, bleeding to death is not a problem. Many people think that one of the robots who falls into the digestion pool was Ironhide, who died at the beginning of the movie. I can not say I agree with this belief - it looks like any miscellaneous robot to me. 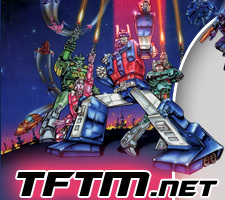 How did the Autobots, after smashing out of Unicron's right eye, make it safely to the planet's surface? Maybe Springer landed them all to safety? Maybe the Dinobots, with their unexplained ability to fly, rescued them all? Maybe they jumped on top of Unicron's left leg and rode it down? My explanation: Wreck-Gar, Magnus, and Perceptor managed to rescue them in the VERY QUICKLY repaired Junkion shuttle. In the original script, the Junkion shuttle was split in two by Unicron, and they manage to get both halves working as independent ships.